As part of his promotional duties for Batman v Superman, Ben Affleck stopped by The Tonight Show to take part in some of Jimmy Fallon's patented brand of celebrity fun. For "Pup Quiz," the duo took turns answering animal trivia, competing for the prize of adorable puppies dressed as superheroes. 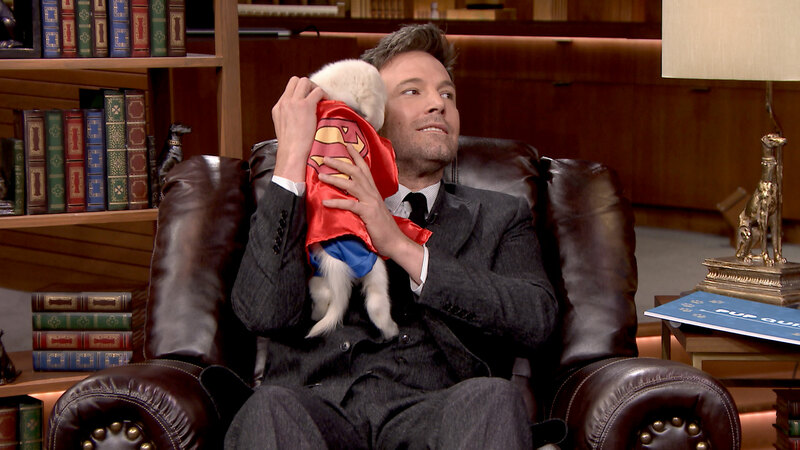 And, wouldn't you know it, all it takes is one tiny dog dressed as Superman to turn Ben Affleck into a Clooney-level charmer. Look at the way he rubs its little ears! You've never felt more like Jennifer Garner in your life. Elsewhere on Affleck's visit, he and Fallon tried their hardest to promote Batman v Superman by enthusiastically stating facts about the film as if they were praise. It's very loud! promised Affleck. It's opening in many countries around the world! raved Fallon. The Overstuffed Batman v. Superman: Dawn of Justice Builds a World, But Is It One We Want?